Summer vacation is something the whole family looks forward to all year long. Fun days at the beach, camping, or amusement parks would get anyone excited! Getting out of your routine is great, but those fun disruptions can lead to some pretty unhealthy choices. New places come with so many things to try, but as always moderation is the goal, and healthy eating is a very high priority. Here are some healthy eating tips for traveling with kids. The airport is a point of weakness for many parents. This is especially true if you have particularly early or late flights. In order to avoid those seriously unhealthy items at the very beginning of your trip plan to pack a plane picnic. Pick everyone’s favorite healthy foods. Fruit, veggies, cheese, whole wheat crackers, and natural lean sandwich meats are great choices. As you’re a discovering your new surroundings having granola bars or mini containers of peanut butter and crackers will keep you from having to stop for more unhealthy choices. You can make these snacks your self. there are also a ton of healthy brands you can buy. Make sure to always read the labels to understand exactly what you are getting. Multivitamins can help fill the nutritional holes in your families diet. No one eats perfectly so these, along with a (mostly) healthy diet can really help. 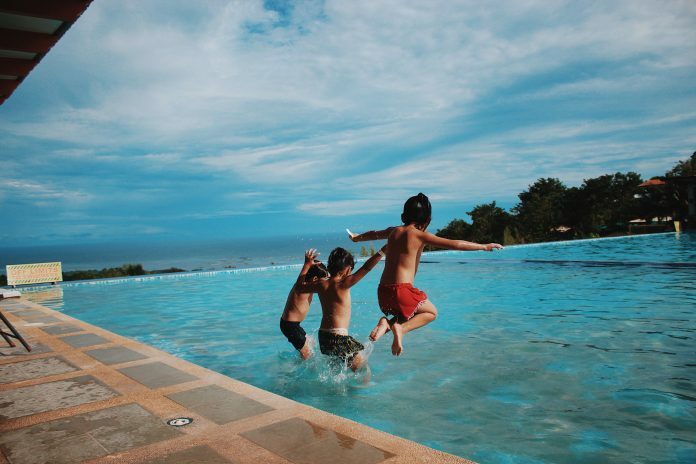 Getting your kids to take one every day will keep them in that habit on vacation. Many multivitamins for kids come in chewy form, so they are easy to tote in your bag, and your kids won’t need to stop what the fun to take them. Eating is not the attraction while on vacation. Make sure that you are getting your family excited about all the things to do and memories that are going to be made. Try giving each kid the designated photographer for each outing, let them engage in their adventures and take ownership of their memories. Bargaining just doesn’t work. You want your kids to eat their veggies, but they are determined to avoid them completely. Telling them, “Eat some of this, and then you can have some of that” won’t work. They’ll end up eating a spoonful of peas and a giant ice cream cone, and you’ll end up more than just a little frustrated. Before your vacation stand strong when they ask for a treat. They have to eat all of their food before dessert. If they don’t, that’s okay, but no dessert. No need for stress or yelling, let them choose. If you set these boundaries before your trip you’ll save a ton of stress. Remember that your kids follow you. If they see you avoiding healthy eating they will absolutely do the same. If you make it a priority to eat right, it will be easier to get them t make healthy choices. As you travel, make it a rule that everyone tries new food, even if it’s just a bite. You never know what you like until you try it. I’m talking to you too parents! If you are excited to try new foods, the kids will be too! Angelique is a freelance writer with an emphasis on all things health and family. She enjoys helping families find solutions to their healthy lifestyle challenges. She spends her days crafting engaging content, working on DIY projects and making every moment count with her family. Follow her on Twitter at https://twitter.com/xAngeliquexoxo. She’d love to hear from you!